The Anabolic Window: The key to unlimited muscle growth! Other Ingredients: AFTERSHOCK Fast Absorption Protein Blend™ (Partially Hydrolyzed Whey Protein Isolate, Lactose Free Whey Protein Isolate And High Growth Factor Ultra-Filtered Whey Protein Rich In Lactoferrins And Immunoglobulins), Glycogenx™: A Polymerized Glyconutrient Providing Cellular Rehydration And Glycogen Replenishment (Long Chain Polysaccharide Maltodextrin), Cane Juice Solids, Natural And Artificial Flavors, Citric Acid, Potassium Citrate, Sodium Citrate, Vegetable Juice (For Color), Sucralose. Are you sore, aching, and exhausted after you workouts? Do you often skip your next workout because you haven't fully recovered? The team at Myogenix brings you their newest supplement to help you fight through the pain so you can stay motivated on your fitness journey!!! Aftershock Post Workout by Myogenix is the ultimate Post-Workout recovery supplement in the game. The key to muscle growth is taking full advantage of your anabolic window. The anabolic window lasts up to 30 minutes after you have completed your workout. During this 30 minute window your body is primed for rapid muscle growth. Aftershock Post Workout contains critical and necessary nutrients for muscle growth and muscle recovery. What are the benefits of Aftershock Post Workout? How does Aftershock Post Workout work? 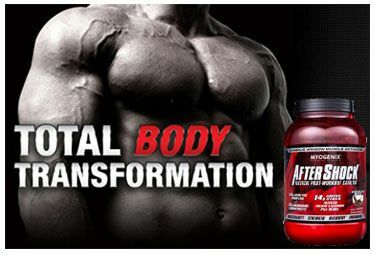 This advanced formula takes advantage of the bodies anabolic window which supports muscle growth and recovery. Aftershock contains 34g Lactose Free protein, 30g mass building carbohydrates, 8g amino stack, patented Creatine & Glutamine chelates. Whey Protein: Contains 34g of fast absorbing protein which supports muscle growth. This lactose free protein provides your muscles with a pure source of protein after your workouts. Carbohydrates: After every workout your body is lacking Glycogen. Aftershock contains 34g of mass building carbohydrates which replenish glycogen. Amino Acids: Are the building blocks for protein synthesis. BCAAs are mandatory for muscle growth and recovery. The Amino Stack contains 4 amino acids including the 3 essential amino acids: Leucine, Isoleucine, Valine, and Arginine. Creatine: Creatine is arguably one of the most important supplements for building muscle mass. Magnesium Creatine Chelate is a fast digesting creatine that holds little to no water retention. How should Aftershock be dosed? Mix one serving of Aftershock (80g) with 12 to 16 ounces of water and consume immediately after exercising. For Total Body Transformation, use HyperShock pre-workout, and MyoLean Evolution.